Nesco®’s top-of-the-line unit! Larger and more powerful than any other. Expands to a giant 30 trays so you can dry large quantities all at once! 1000 watts of drying power means you can dry more, faster. 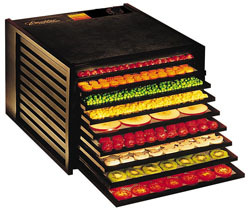 Patented Converga-Flow® fan forces heated air up the exterior pressurized chamber, then horizontally across each individual tray, converging in the center for fast, even and nutritious drying. No flavor mixing! No need for tray rotation. Fast, Powerful Fan! A quiet, 2,400-RPM motor and specially designed 4-1/2 inch fan mean faster, more nutritious drying. Four times faster than dryers that have no fan or motors. Adjustable Thermostat! Different foods need different temperature settings. The adjustable 95–155-degree F. thermostat gives you the flexibility to get the best results. Clean-A-Screen®. Flexible screen, allows easy drying of small items such as herbs, spices, and potpourri. Jerky Spice Packet and Cure—Make your own jerky at home! Need more room? 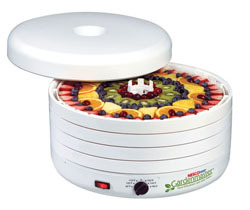 Add-A-Tray® Accessory Packs add 2 extra trays to expand your dehydrator's capacity. The larger Garden Master can take up to 30 trays; the smaller dehydrators can go up to 12 trays high and still dry evenly! Fruit Roll Sheets—Great for making Fruit Rolls for the kids and for other messy foods. Exclusive "no spill" lip allows you to dry liquids and semi liquids. Dry up to 3 cups of puréed fruit on each sheet. Make fruit leather with no added sugar or preservatives. It's as easy as pouring applesauce on the Fruit Roll Sheet. Also great for dry soups and sauces. Perfect to use (if you're making messy foods) on the bottom tray of your dehydrator (without food on it) to catch the drips and make clean-up easier. Clean-a-Screen®s are reusable, plastic mesh inserts which are perfect for drying small items, such as spices and herbs or craft materials that would normally fall through the spokes of the trays. Just place on top of trays. Flexible screens make drying sticky foods like bananas and pineapple easier to remove. Also flexible enough to form a convenient "pouring" spout to transfer dried food to storage container. We Carry the Bosch Universal Plus with all of the accessories. Please call us for more information! Our classic Nesco® 18-Qt. Roaster, with removable stainless steel cookwell. The same great features as always, but now it's easier to clean, and food won't stick to it. Use it as your primary kitchen oven or as a second oven for the family room, porch, or cabin. It is especially handy for the holidays! Roast your turkey in the Nesco® and save your oven for pies, breads, etc. This unit is ideal for large meals and entertaining in the home. Roast a whole turkey, up to 22 pounds, pot roast, pork roast, ham, or whole chickens. Bake cookies, cakes, pies, quiche, even whole meals! Cook soups, stews, lasagna, and hot dishes. Steam/poach vegetables, seafood, and poultry. Slow cooks, too. • Unique CIRCLE OF HEAT® construction means food is cooked from the side, not the bottom, for moister cooking results. Most versatile appliance ever made! This is one of the original Nescos®, just like the one that Grandma had! Roasts, bakes, cooks, steams, slow cooks, and serves all in one. Traditional oval shape with durable porcelain-enamel finish is portable and convenient. Perfect for a batch of chili or soup, a chicken, pot roast, or cornish game hens. • Full 6-Quart capacity serves up to 6 people. This Nesco® 6 Liter stainless steel pressure cooker also functions as a Slow Cooker and a Steamer! Operated with a programmable digital timer that can be set to delay cooking up to eight hours. Ideal for making healthy & delicious homemade soups, stews and chili. Fish, chicken, and vegetables cook to perfection in minutes. Pressure cooking preserves flavors and nutrients and speed-cooks inexpensive cuts of meat into great tasting meals. Set includes: 6-Liter pressure cooker with removeable non-stick chamber, steam rack, and instruction manual/recipe book. • Cover locks securely into place. • Safety steam release prevents cover from being opened until pressure is reduced to a safe level. I love this funnel—have used it for two years now in canning, and it is awesome. It wraps around the inside AND outside of the jar (both wide- and regular-mouth). Not only does it keep the rims clean, it stabilizes the funnel so you can have both hands free! If you are a canner—or know one—this is a must have!